This month our f/22 profile is Amanda Grace who is a photographer in eastern Pennsylvania. Amanda started as a child and baby photographer and has recently expanded into wedding photography. I have always been impressed with Amanda’s work as she is able to capture the unique moments from her subjects which is always quite a challenge with young children. I hope you enjoy my e-mail interview with Amanda. Amanda, how long have you been photographing and what got you started? Gosh, I have had a camera in my hand for as long as I can remember. I progressively learned more and more about photography throughout my life, however I really started getting serious a few years ago. One of the most amazing things about photography is that it is always changing. I learn something new every time I pick up my camera. I was first introduced formally in high school. My school had a beautiful darkroom and great teacher. I was the kid begging to keep the camera longer than necessary and spending all of my extra time there!! Prior to becoming a full time photographer, you were working in an educational field. How do you find this background and knowledge helps you with your artistic visions of photographing childhood? My educational background has helped me tremendously and continues to help me with every shoot. I had been teaching autistic children before deciding to go back to school and pursue photography full time. It has taught me how to “modify” behaviors to get the outcome I need. It has also helped me to be very sensitive and patient. I think a major mistake photographers and parents sometimes make is telling the child what to do instead of letting them be who they are. I allow a lot of flexibility in my session and let the child choose activities in an effort to make them feel that it is about what they want and this helps to bring out their true personality. 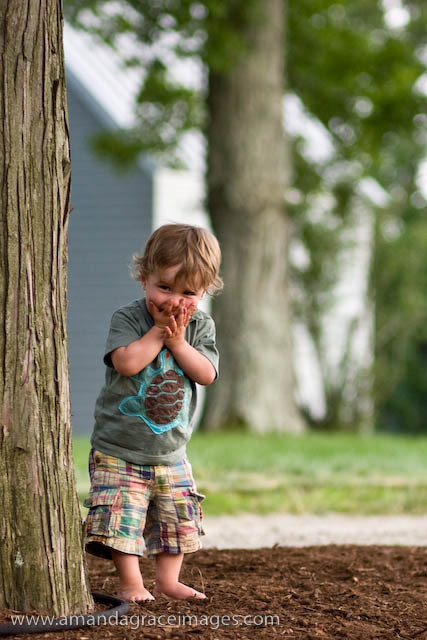 Children are so honest, every expression comes from a natural reaction to their surroundings. I pride myself on letting a session unfold naturally so that I may capture a personality, not just a smile. 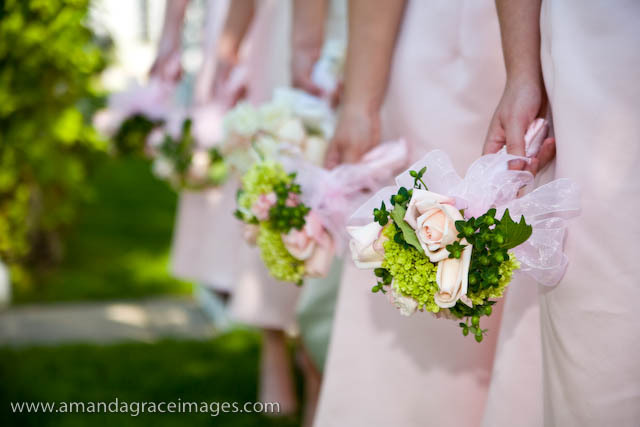 Initially Amanda Grace Images was focusing on photography of babies and children, but has expanded to weddings. How did you decide to expand your business? I am not sure that I actually made the decision to expand, I don’t recall one clear moment… it just happened. I was helping out another photographer as a second shooter at weddings and I began getting my name out there I guess. I started to receive a lot of inquiries and it has been growing ever since. I did my first advertisement this month and I am really excited about it, it is fun to try new things and stay fresh. What photographers do you follow on a regular basis, and what about their work inspires you? I love Annie Liebovitz. I love her work but I love understanding the way she has evolved, her new book “at work” is super inspiring! It gives me hope and makes me look for that one CHANCE, and it motivates me to be ready when it happens. I also follow my friends, colleagues & past teachers obsessively! Having a network of “like” professionals to communicate with is one of my biggest assets. I like to think we continually inspire each other, I know a lot of my inspiration comes from them! This is a tough question because I feel that a good photographer is always evolving. You need to change in order to grow and stay fresh…. but for the purpose of business consistency I would say I have a photo journalistic style. My weddings are not filled with overly posed images. I strive to fade into the background re-creating the day image by image, moment by moment. I need to establish an intimacy with my clients so that I can fully create the emotion and craziness of such an amazing day. This intimacy is established over many months of planning and communicating with them. I fall in love with everyone I photograph at some point. The greatest compliment I can receive at a wedding is that they didn’t even notice me there. I use a similar approach with children. I approach each session with endless possibilities and I strive to make it as unique as the child I am working with. It is not unusual to see me playing peek a boo or having a tea party in the play room. I need to know the child so that I can capture who they are right now. Do you have any projects you are planning to do in the future? In January I made the commitment to never be without my camera, for a whole year. I always have it within reach… just in case. There have been so many times in my life that I find myself somewhere I wish I had my camera. No matter how many times you miss the shot, you never forget it. I have a list in my mind of all the things I should have recorded but did not because I didn’t feel it important enough to always be with my camera. What have you learned along the way which has been a valuable lesson in your business? I have learned that consistency is the most important key to running a successful business. Clients must always get what they expect from you and more. Make friends with your “competition” and create a level of respect with them. I believe that although you may be trying to do the same thing you do it very differently. I know my clients will choose me for my style and therefore competition doesn’t exist. They are no longer competition but colleagues, friends and mentors. A photographer that i had the pleasure of learning so much from, Neil Chaput de Santoinge, gave me a great piece of advice. He said that a Good Photographer never keeps secrets and is always willing to teach someone else how they created an image. This meant a lot to me because I feel that teaching is one of the best ways to keep learning. I spend many hours a month with another wedding photographer just learning from each other and playing with new ideas. And most importantly, always be honest to yourself and your clients. Thank you Amanda for taking the time to be the f/22 photographer this month. The following images are a sample of Amanda’s work, more of which can be seen at her website. Images Copyright Amanda Grace Images, all rights reserved. Be sure to check out more of Amanda’s work at Amanda Grace Images.